The nectar of the gods: one of five unlabeled honeys represented in the competition.Photo by Neil Giardino. The Waldorf-Astoria was abuzz last night, its conference room and rooftop garden swarming with gourmands, bloggers, and a celebrity chef or two. September is National Honey Month and to celebrate the sticky elixir, the hotel was host to its second annual Battle of the Bees. The celebration of honey, which began with a deluxe spread of Hors D’oeuvres and cocktails, soon gave way to heady competition. Guests and judges alike sampled from five jars, each varying slightly in hue, from shades of shimmering wheat, to rich tobacco-brown. Like connoisseurs of fine wine, the judges – self-anointed honey experts – were on-point with their words. One judge described a sample as “floral and almost woody.” Another opted for brevity – “Exuberant,” he gushed. But it was James Oseland, noted food writer and former editor in chief of Saveur Magazine, who best captured the essence of describing honey harvested from urban beehives. “I can taste trees, grasses, and a little bit of 42nd Street as well. I like it,” he quipped. Urban beekeeping has surged in popularity after the undoing of a city-wide ban on honeybee-keeping two years ago. To many in attendance, last night’s event felt like a crowning moment. Participants, guests, and judges came from all over to celebrate the local craft and to sample the honeybees’ sweet yield. Will McGee is a senior at York Preparatory School on Manhattan’s Upper West Side. He came to Battle of the Bees in order to champion honey from his school’s hives. Initially, beekeeping was about reaping obvious benefits. “At first I just did it for the free honey. But eventually I started getting interested in observing the flight patterns and behavior of the bees,” McGee said. McGee’s tenure as beekeeper at York Prep will come to an end upon graduation, but that won’t stop him from tending bees. He plans to attend Johns Hopkins University, which has a student beekeeping program. In addition to York Prep, Battle of the Bees challengers included Bryant Park Honey, Brooks Brothers Honey, Highline Honey, and the Waldorf Astoria’s own Rooftop Honey. After the tasting, a hush descended upon the crowd as the judges conferred. 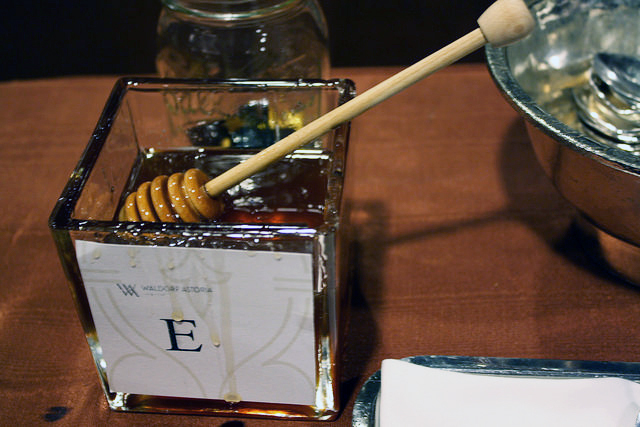 For the second year in a row, the Waldorf Astoria’s Rooftop Honey took first prize. A group of the curious was later offered a tour of the beehives. The large rooftop garden felt like a veritable meadow flanked by staggering views of Manhattan. Strawberry and tomato plants, an endless variety of herbs, and five apple trees flourish here. From one angle, the Chrysler Building is shrouded in patches of lavender and lemon verbena. Aphisith Phongsavanh, 30, of Queens is part of the culinary team at the Waldorf Astoria’s restaurant, Peacock Alley. He helps prune the 46-story high garden, which contains six beehives. He said harvest comes about every four months. And with a yield of about 400 pounds per harvest, the Waldorf Astoria infuses many of its menu items with their own locally-sourced, prize-winning honey.